A floating jetty – great for recreation but unsightly and slimy algea can make it dangerous to use. Decking and jetties are usually surfaced with grooved wood or a similar-looking composite material. When a jetty or a wooden decking is left un-treated, moss and algae often begins to grow on the surface, which can take away from the overall look. However, not only is it unsightly, but the resulting slippery surface, when wet, can be very dangerous. Cleaning Doctor has a solution to both problems. Cleaning Doctor first treats the surface with a cleaning agent and then pressure washes it with a rotary cleaning head that cleans every groove without leaving any marks, like some normal jet washers do. 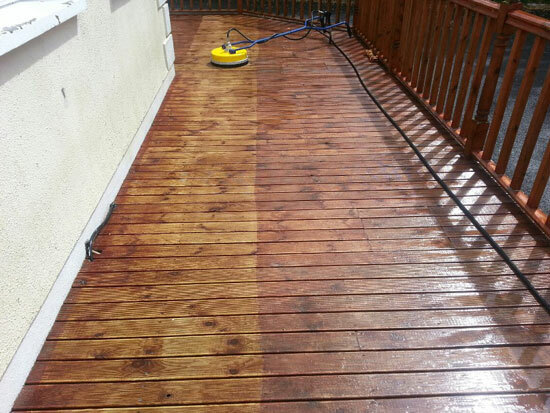 Rotary head cleaning of domestic decking. For more information on getting your decking or jetty cleaned, please call the number below or click the link to the enquiry page.